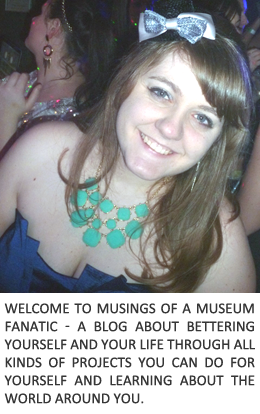 Musings of a Museum Fanatic: High Five for Friday! This week has actually turned out to be a pretty good one after the poop that was last week. 1. The hubby got a job interview this week! It went really awesome and they want to bring him in for a second interview later this month. 2. I've actually been quite productive this week in most of my goals and will continue on with that today. I'm partially done with my About Me section so be sure to check back this weekend and hopefully it should be up!! 3. This probably doesn't count since it's tomorrow but a couple of friends and I are getting mani/pedis done. I didn't get a single pedicure this summer or fall so I really want a little pampering. 4. This week I figured out a way to do work from home so if the weather gets crazy or I need to make up hours I can do so from the comfy of our couches! 5. It's the weekend yay! All great things! I'm excited for you & such a great week. YAY for the job interview- I'm sending him good thoughts! Have a GREAT weekend, my friend!